Within the Afghan National Army (ANA) corps is the Corp Engineer Kandak or CEK. The CEK contains units that do both vertical and horizontal construction. March 10, 2014. "207th Engineers excelling in construction projects". DVIDS. Soldiers of the 130th Engineer Brigade's Engineer Training Team (ETT) have been working with the ANA 207th Corps Engineer Kandak (CEK) since they graduated from the Combined Fielding Center in December 2013. March 6, 2014. "Afghan's 209th CEK taught by 365th ENG BN". DVIDS. The RC North Corps Engineer Kandak receives instruction from the 209th Kandak Engineer Training Team (ETT). January 30, 2014. "DynCorp International to Provide Training to Afghan National Army Engineers". Herald Online. October 10, 2013. "4th BCT supports ANA vehicle maintenance". The Fort Campbell Courier. Members of 4th BCT of the 101st Airborne Division on SFAAT 4 are assisting the 203rd Corps Engineeer Kandak (CEK) with vehicle maintenance on FOB Thunder. One problem identified by the SFAAT is that the CEK has new vehicles that require servicing and maintenance; however the CEK soldiers need training on maintenance and lack spare parts to do repairs. July 13, 2013. 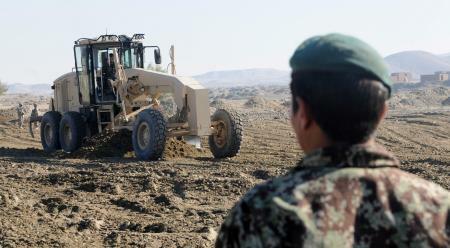 "Afghan Army engineers complete project for commando brigade". DVIDS. The Afghan 203rd Corps Engineer Kandak (CEK) builds out a tactical operations center for a newly formed commando brigade of the ANA.